HONOLULU, Hawaii, March 16, 2012 (ENS) – In a decision Thursday, the Ninth Circuit Court of Appeals has upheld a federal district court settlement limiting the number of loggerhead and critically endangered leatherback sea turtles that can be caught by Hawaii’s longline swordfish fishery. The settlement responded to a lawsuit brought by conservation groups Turtle Island Restoration Network, Center for Biological Diversity and KAHEA challenging the National Marine Fisheries Service’s decision in 2009 to nearly triple the number of sea turtles the fishery could catch. The settlement rolled back the limit to prior levels. Today’s decision rejected an appeal by the fishing industry, which sought to invalidate the agreement. Swordfish longline vessels trail up to 60 miles of fishing line suspended in the water with floats, with as many as 1,000 baited hooks deployed at regular intervals. Sea turtles become hooked while trying to take bait or become entangled while swimming through the nearly invisible lines. These encounters can drown the turtles or leave them with serious injuries. Sea birds such as albatross dive for the bait and become hooked; marine mammals, including endangered humpback whales and false killer whales, also sometimes become hooked when they swim through the floating lines. Turtle Island Restoration Network, Center for Biological Diversity and KAHEA sued the National Marine Fisheries Service over its decision to increase, from 17 to 46, the number of loggerhead sea turtles the fishery could catch in a year before being required to shut down. 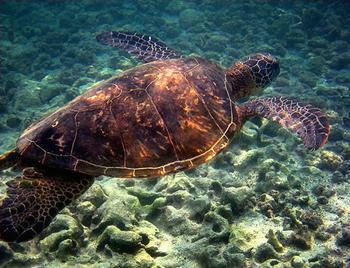 The plaintiffs and NMFS agreed to settle the case by rolling back the number of loggerheads allowed to be caught to 17 while the agency decided whether to uplist the species and prepared a new analysis of the effects of increasing the turtle catch limit on the species’ survival and eventual recovery. Judge David Ezra approved the settlement as a consent decree. While the appeal was pending, NMFS in September 2011 changed the loggerheads’ designation to “endangered.” In January of this year, the agency also issued a new biological opinion as contemplated by the consent decree. That document proposes to increase the number of endangered loggerhead sea turtles the longliners can catch from 17 to 34. It also increases the limit for catching endangered leatherback sea turtles from 16 to 26. Notably, in 2011 the fishery was forced to close after it caught its limit of leatherbacks.